Each year I look forward to seeing pics of holiday decorations at the White House. Paper ornaments are often included and 2015's decor doesn't disappoint. 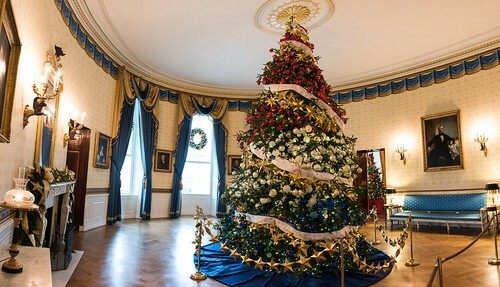 The theme A Timeless Tradition is carried out in a multitude of elegant ways and repurposes items from the White House holiday collection... only ten percent of the decorations are newly made, quite an achievement considering there are 62 trees and more than 70,000 ornaments! Airmail envelopes convey the importance of reaching out to service members, especially at holiday time. The envelopes are used to decorate wreaths and fill mailboxes, and are cleverly rolled into bows and tree garlands. 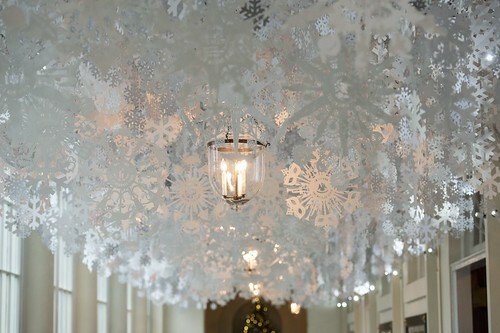 This stunning East Colonnade installation is comprised of kirigami snowflakes made by Washington, D.C. school children that feature their hand-written ambitions. Additional cut paper flag and seal snowflakes represent each of the U.S. states and territories. The Library's theme is a holiday forest of books and manuscripts to inspire and educate. 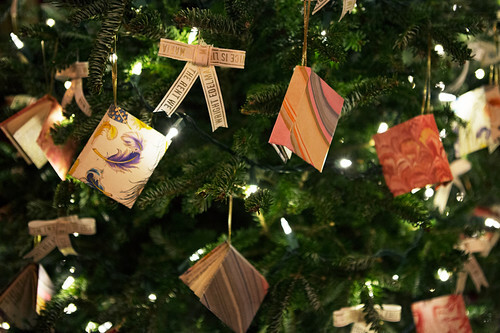 Handmade book and bow ornaments decorate a tree. You'll also find origami trees, snowmen with quote scarves and more if you have the opportunity to visit in person. 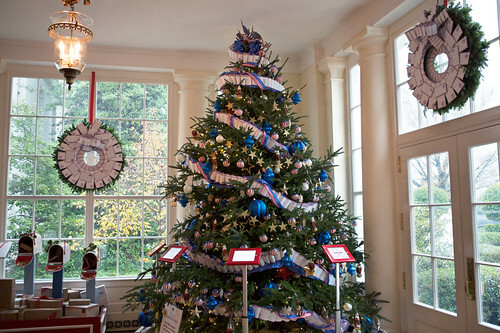 The official White House tree, an 18.5 foot tall Fraser fir, is located in the oval Blue Room and is decorated in red, white and blue ornaments. It features holiday messages of hope for the troops along with garlands of folded gold stars. 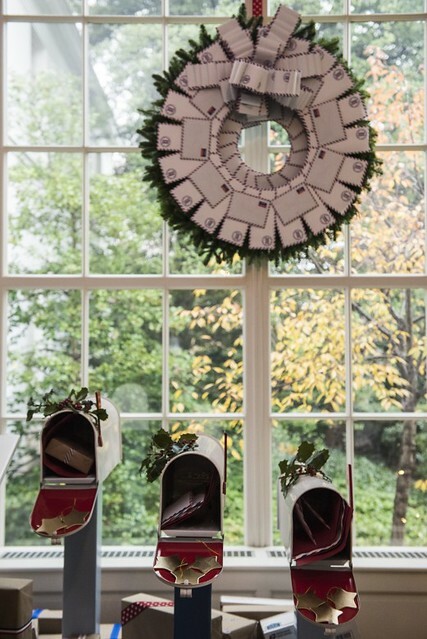 Don't miss previous posts about White House holiday decor in 2014 and 2013. That is fun to see. It's great that only 10% are new. Must reduce, reuse, and recycle! I agree! Something old can be new again. Happy New Year!